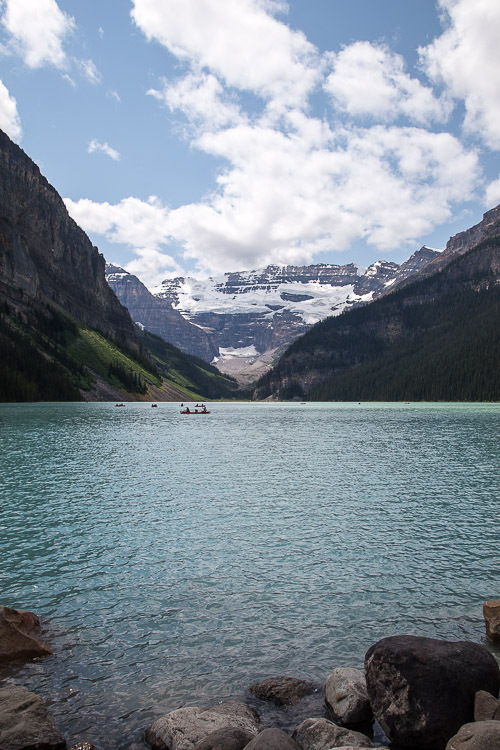 I try to be mindful of our travel budget when vacation planning, so spending a night at the Fairmont Chateau Lake Louise was out of the question. After our morning at Moraine Lake, though, we treated ourselves to lunch there, at the Lakeview Lounge. The restaurant’s host warned us that it might be too chilly to sit outside, but we were having none of that. 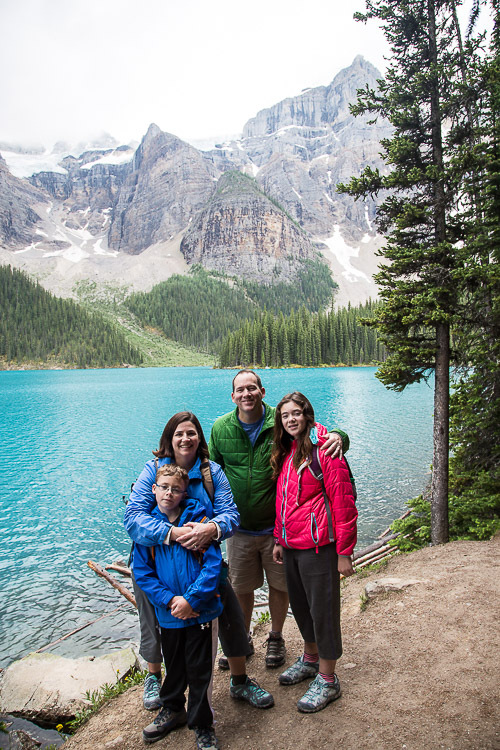 We had jackets on, after all, and there was a spectacular view of Lake Louise to be had. I realize now, that I didn’t take a single photo of my lunch that day (the most wonderful butter chicken with naan), and that is a testament to how in-the-moment I was. 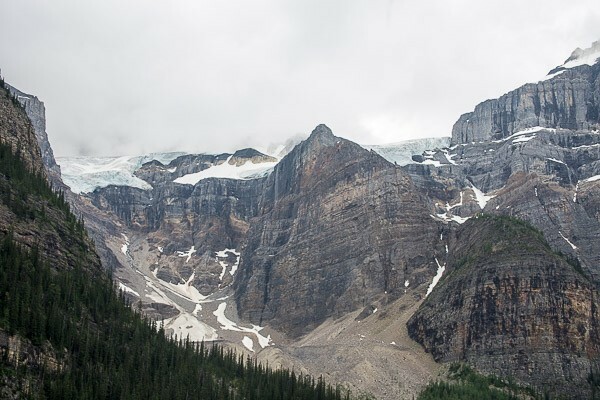 We would come back to Lake Louise in a couple of days to hike the Plain of Six Glaciers Trail. Our experience on that hike deserves its own post – I can’t do it justice otherwise. 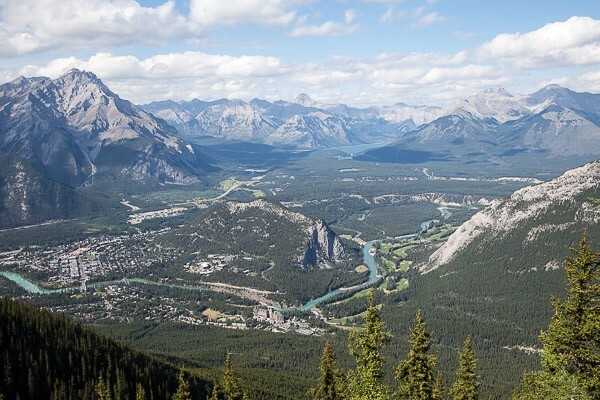 One of my son’s favorite experiences in Banff was riding the Banff gondola to the summit of Sulphur Mountain. I don’t enjoy heights, and I don’t enjoy riding backwards, but the gondola was a neat ride. I did my best to reign in my imagination (filled with images of steel cables snapping followed by our dramatic plummet to the earth) and enjoy the quiet rumble of the gondola’s ascent to the top. The view of Banff from the top was incredible, even with the haze that was present that late afternoon. On the morning of our second full day in Banff, we had a quick breakfast then drove north from the town of Banff to Lake Louise. We stopped at a bakery near the Lake Louise Visitors Center and bought sandwiches for our lunch later that day. 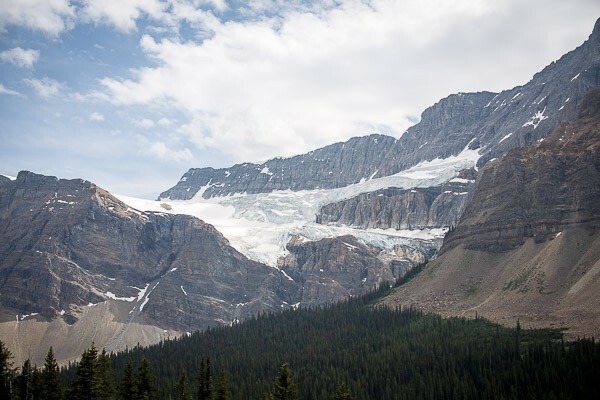 We were heading out on the Icefields Parkway, to the Athabasca Glacier in Jasper National Park. A packed lunch made the most sense. 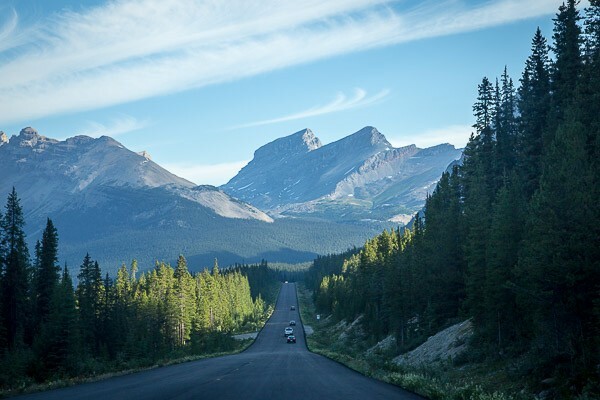 The Icefields Parkway is a visually spectacular drive. I drove my husband crazy during the first half of our trip. 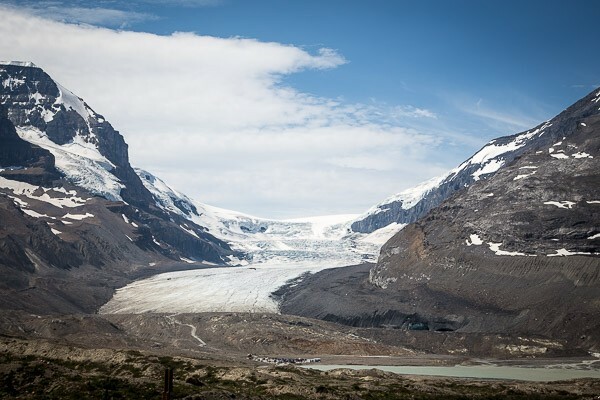 I wanted to be at the Columbia Icefield Glacier Discovery Centre by 10:00 am, hopefully before any tour buses arrived, so I wouldn’t let us stop at any of the numerous scenic overlooks or pull outs. 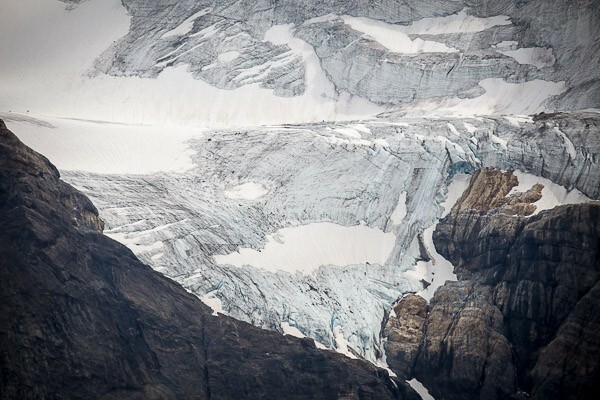 I’d read about the crowds at the Icefield Centre, and I don’t do crowds. Female bighorn sheep. 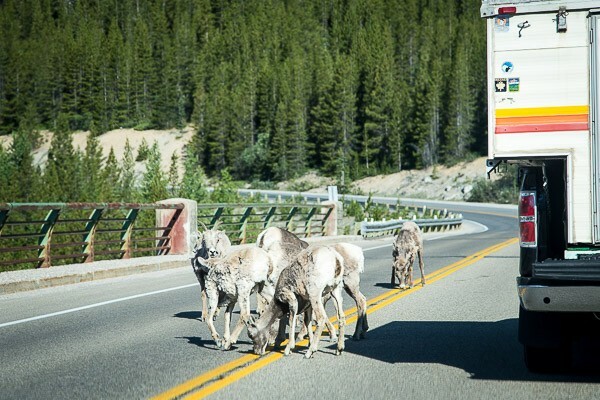 They lick the road for salt and minerals. After standing in a queue for longer than necessary, I purchased four tickets for the Glacier Adventure. The word “adventure” seems an overstatement, but it really was great fun. 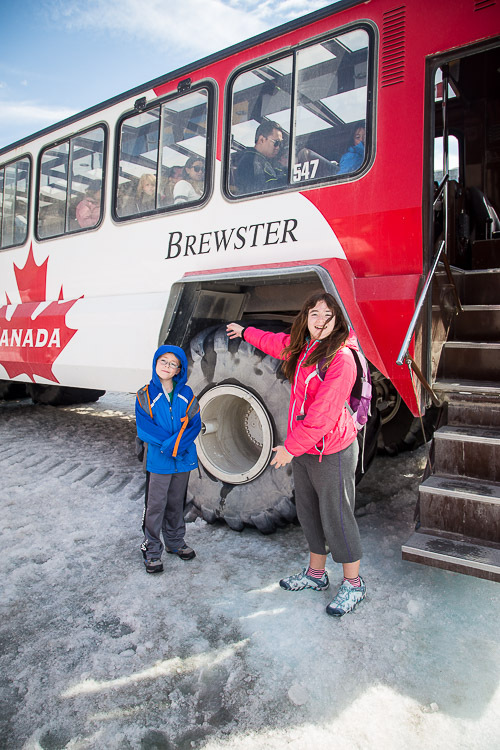 After a short wait, we boarded a bus which took us to the Ice Explorers, giant vehicles with massive wheels designed for icy terrain. 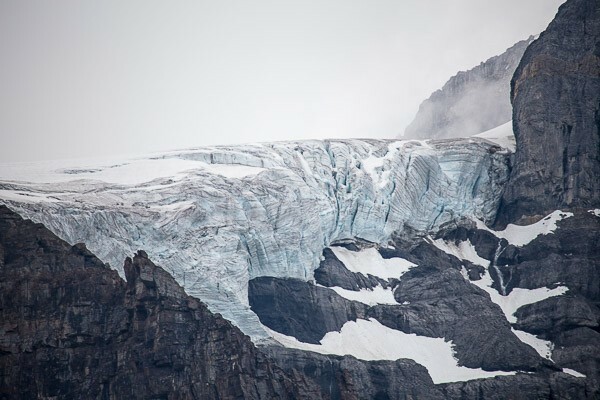 After boarding an Ice Explorer, we bumped and jolted our way onto the Athabasca Glacier, across the Icefields Parkway from the Icefield Centre. 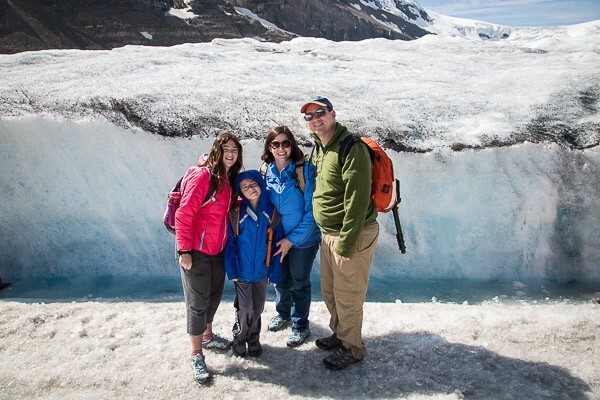 The glacier experience was touristy, but one that I am so very glad we did. Standing on a glacier is surreal and awe-inspiring. 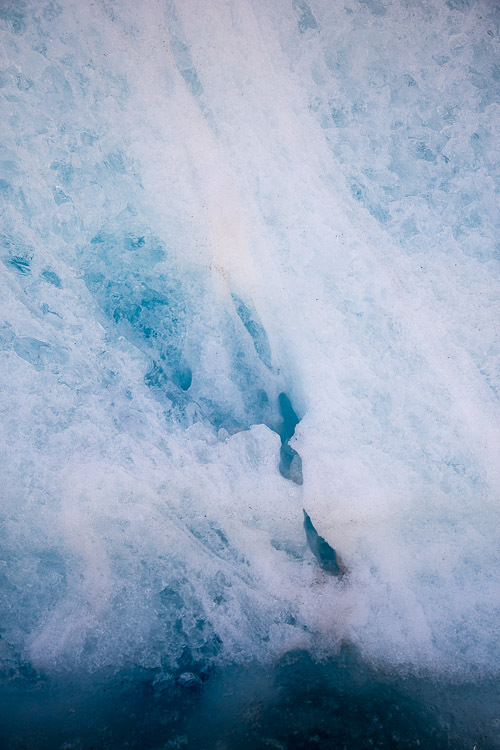 Our time on the glacier was short, but in the few minutes we had there, we crunched around on the uneven ice and tried to avoid occasional puddles of icy water, and I could not stop grinning. 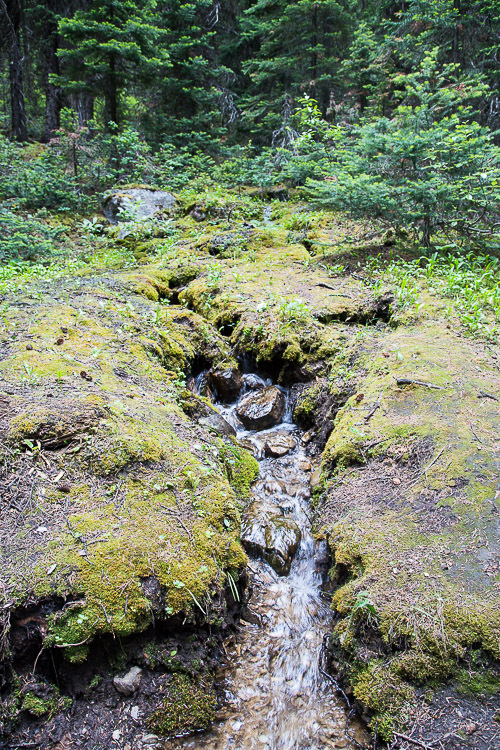 Streams of water trickled through the ice, finding paths of least resistance toward the valley below. Tourists (including us) snapped selfies and photos of our feet on the ice. It was close to 1pm by the time we left the Icefield Centre. 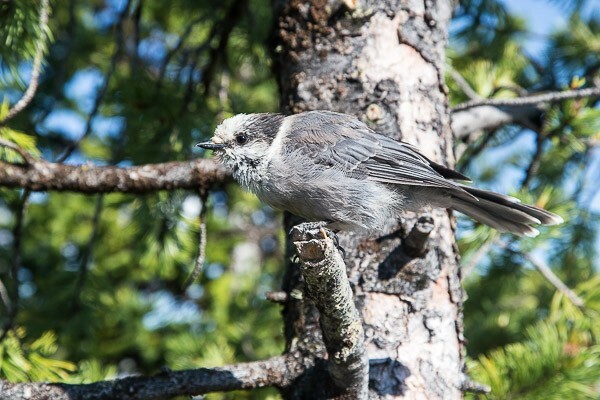 We made a quick stop to have lunch at a trailhead near a meadow, and then we began our journey back to Banff along the Icefields Parkway. 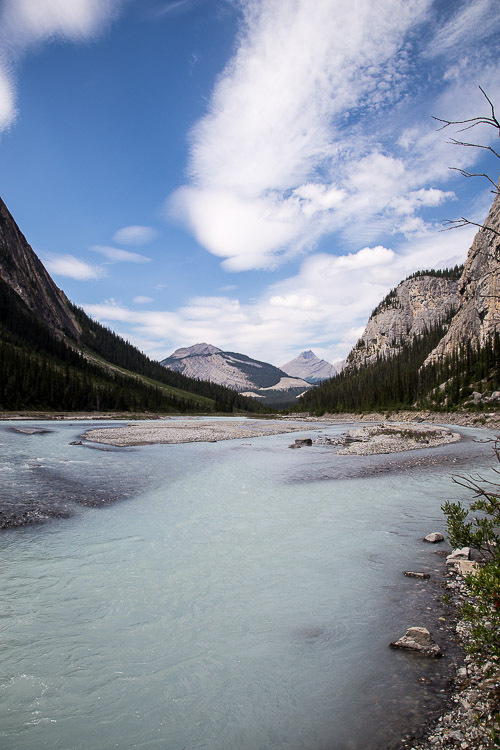 There are so many beautiful stops to make along the route between the Icefield Centre and Lake Louise. 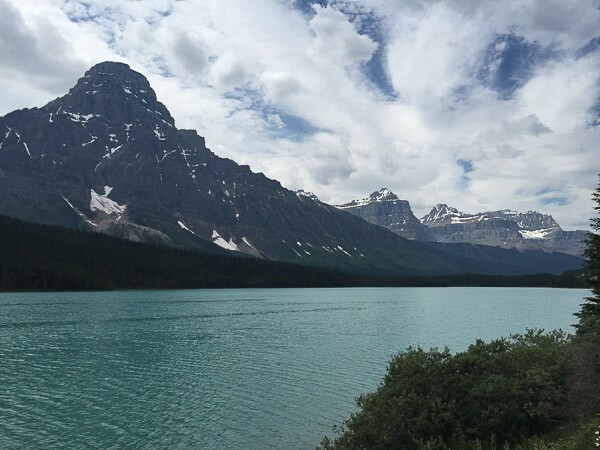 While the kids played on their iPads in the back seat of our Chevy Malibu – they intermittently looked up, mostly when I got frustrated and yelled at them to LOOK OUT THE WINDOW AT THE GLACIERS – Sam drove and we marveled at the scenery. Oh, how we marveled. 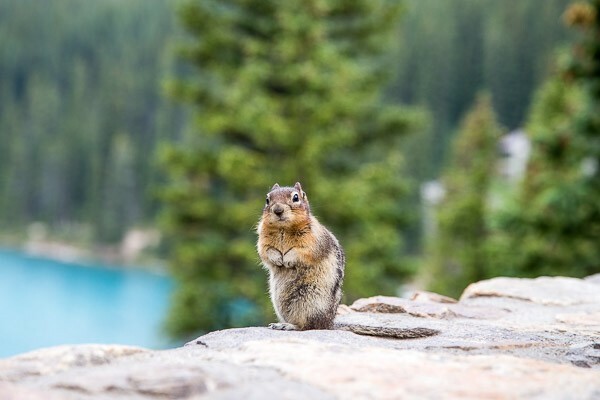 The hike to Peyto Lake was a short and buggy one. On arrival in Banff, we bought family-friendly, no-chemical bug spray. This was a mistake. 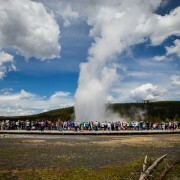 If given the chance, the kids and I would have doused ourselves in carcinogenic bug spray if we’d had it. We stayed only long enough to ooh and aah at the views, then the flies chased us off. 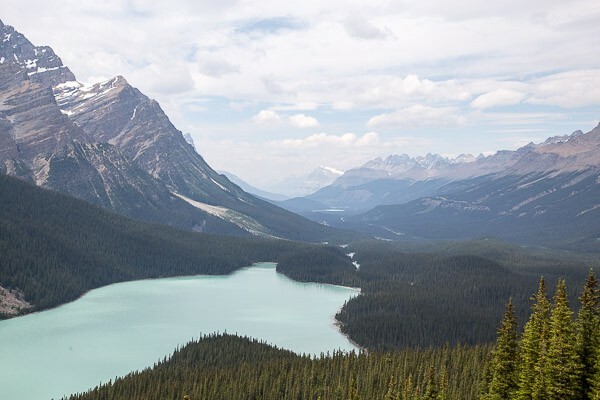 Peyto Lake is gorgeous, though. 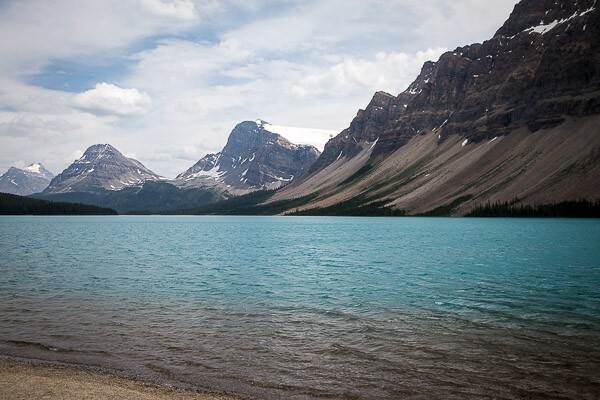 If we had more time – and better bug spray and less whiny children – Sam and I would have loved to have explored more of the area around the lake. 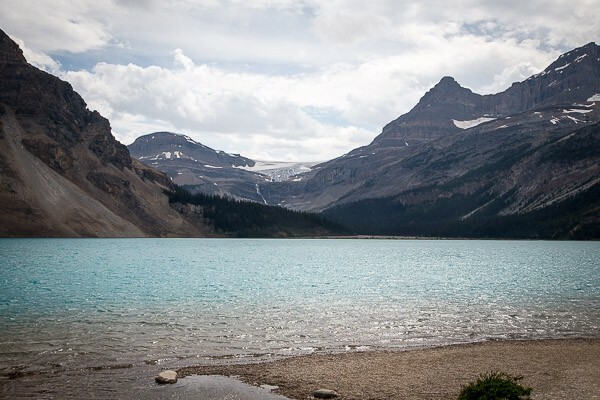 Not far from Peyto Lake was Bow Lake. We turned off the main road and parked at the Num-Ti-Jah Lodge for access to the lake. 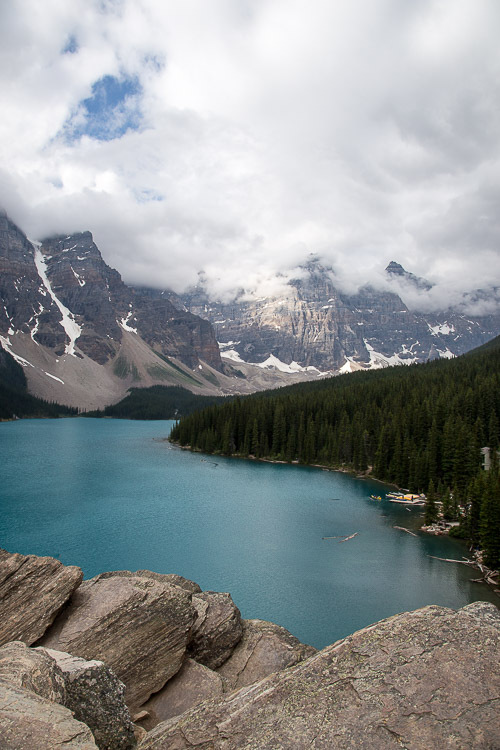 When we walked up on the lake, we felt we’d discovered a secret part of Banff. There were only 5 or 6 other people around the lake while we were there. There were no tour buses. 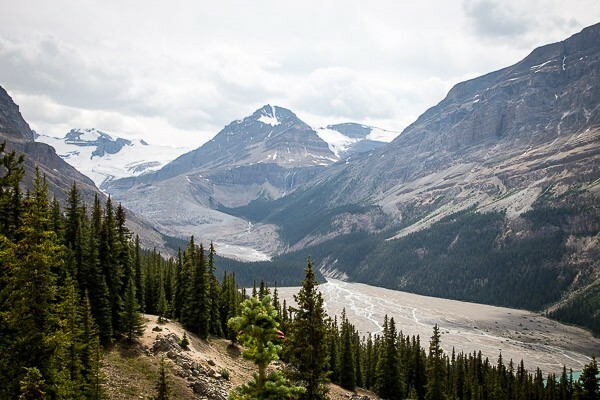 It was quiet, and a cool, crisp breeze came down off the two glaciers that we could see from the lake – Crowfoot Glacier and Bow Glacier. 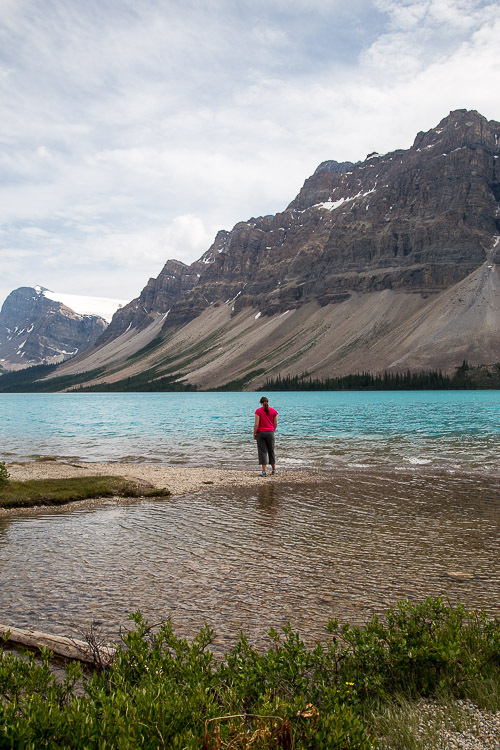 We lingered at Bow Lake, taking in the solitude. Also, there was a surprising lack of bugs. I wondered whether the chilly breeze kept them away, or if perhaps we just got lucky. 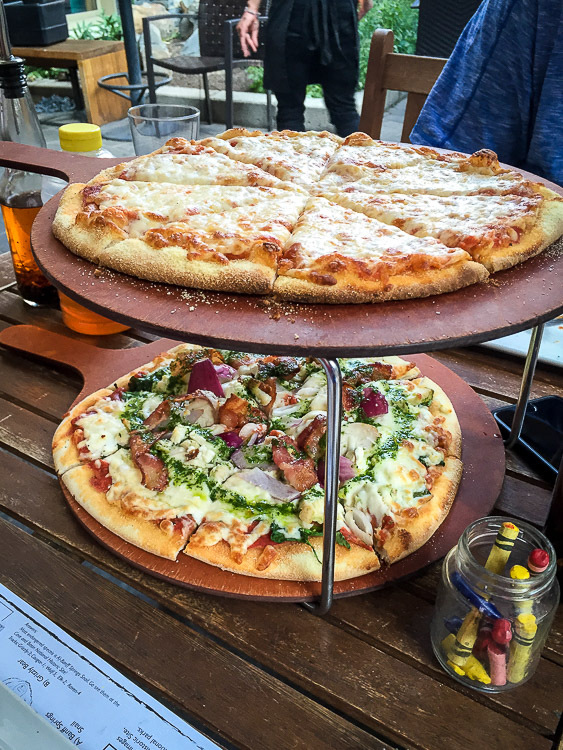 We capped our amazing day with a pizza dinner at Bear Street Tavern in downtown Banff. My friend Cheryl told me that this was one of her family’s favorites, and I’m so glad she pointed us to this place. The pizza was plentiful and the kids and I fell in love with their dipping sauces. I’m not sure if Bear Street Tavern invented the concept of dipping bites of pizza in honey mixed with a rosemary-chili oil, or if they borrowed it from somewhere else, but regardless, the idea is genius. We sat on the restaurant’s patio that night in our sweaty hiking clothes, amidst the well-dressed, stylish Banff crowd, and we didn’t care that we were terribly underdressed and not-at-all stylish (and perhaps even smelly). Our fingers were sticky and tasted of spicy honey, and our bellies were full of great pizza. It was a lovely night, and a perfect ending to our most wonderful day. 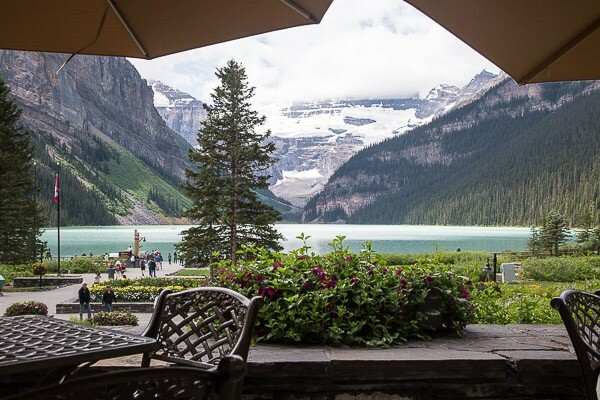 Rimrock Resort Hotel – We only spent one night here, but the views and service were stunning. Delta Banff Royal Canadian Lodge – We spent the rest of our nights in Banff here. It was a lovely little hotel about a half-mile walk from the action in downtown Banff. 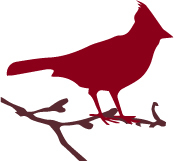 Bear Street Tavern – Great pizza, fantastic dipping sauces (brilliant, I tell you). 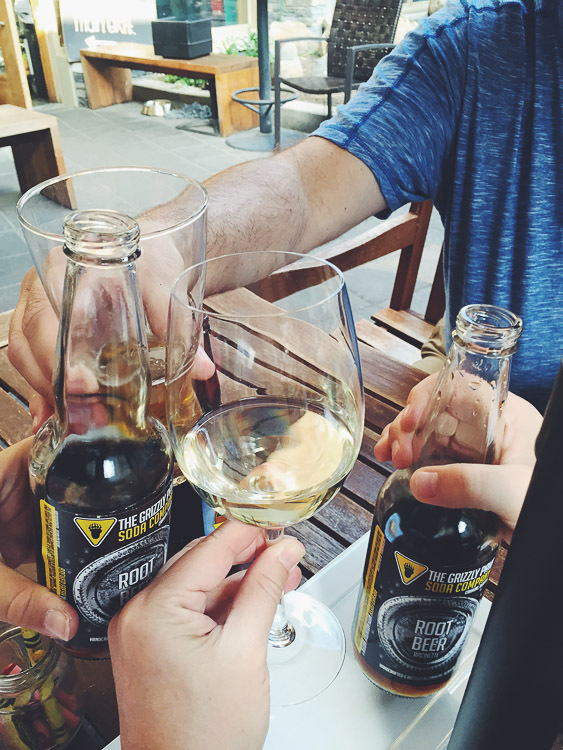 Sit on the patio and enjoy a locally brewed beer or a cold glass of Chardonnay. Elk and Oarsman Pub and Grill – We tried our first ever poutine at the Elk and Oarsman. Two of us were sold. The other two don’t like gravy, and they’ve been asked to rethink their involvement in our family. Fairmont Chateau Lake Louise – I’m sure this is a lovely place to stay, especially during the early morning or late evening hours, when crowds have dispersed. Have lunch at the Lakeview Lounge and request a spot on the patio for the best views. 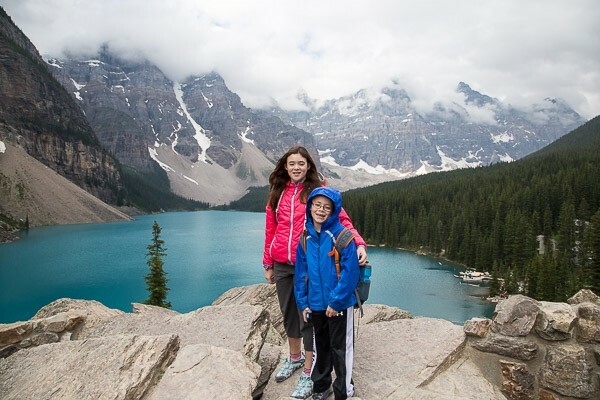 Banff Gondola – Touristy, but fun, especially for kids. 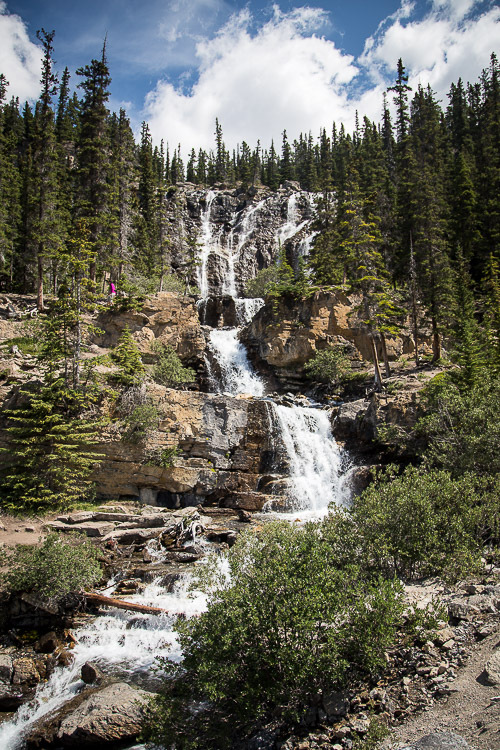 Icefields Parkway – I wish we’d had more time to explore north of the Icefield Centre, up in to Jasper. 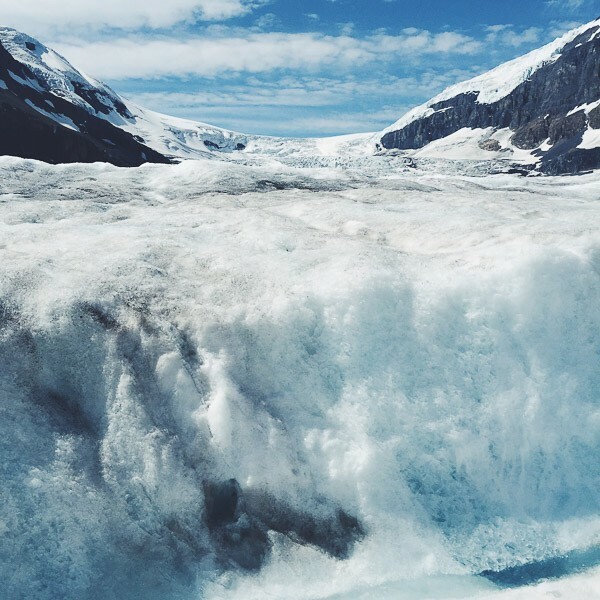 Columbia Icefield Glacier Adventure – Touristy but worth the expense. I adore you so much and I love this post…I am so glad we got to spend so much time together this weekend. I so appreciate how you soaked every moment of this weekend up and seem to have processed it already. I was a tad distracted (baby!) but loved the event all the same. It was lovely to see you, even if we didn’t get to talk much. I was happy to have been able to make it, and am not going to have regrets over missed conversations. A beautiful post, as always! I agree with what Molly said, just sit down and let the book come out. Reading this post makes me wish I had gone to BSP, next year. You’ve summed this experience up better than anyone has or ever will. It’s a transformational (is that even a word?) experience, and I’m glad you had it. Next year, we all cry together. It was such a pleasure finally getting to meet you and getting to chat a little here and there. I told you the other day that I love your work. It’s true. I love the stories, the recipes, the photos. It’s you through and through and THAT is what makes me come back to your site time after time. And I have no doubt that your book will come out of you and it will be beautiful and I’m sure it will bring tears to my eyes. You captured the experience and the purpose of the weekend retreat perfectly. Thank you for this post. Beautiful. Both inside and out. Love your honesty and love hugging these beautiful people vicariously through you. It sounds like it was such a special weekend for everyone involved and I look forward to seeing where this journey takes you. I am so, so happy we got to meet and chat and I think you really captured the feeling of the weekend perfectly. Molly’s words really resonated with me as well. I have had a ton of creative energy for my writing recently, but deciding how to make the time for it and what the finished product might look like feels like the biggest struggle. After this weekend I feel like we’re all in a much better place to begin working towards something that feels a little more clearly defined, right? Gorgeous pics, too! Thank you so much for writing such a beautiful recap of the weekend. It was very nice meeting you and getting to speak with you. It is reassuring to know that we all face the same insecurities, and it was nice to be able to let share them with others. I too feel like their is a book in me, but have no idea how to get it out, Molly was very helpful in that area. I so enjoyed your recap. I always enjoy your writing. I, too, feel like there’s a book in me, but I’m scared to let it out. I’m scared it will consume my life, and right now, I have too many priorities. I adore Maggie’s shirt. It just shines on her. this is so beautiful! a great reminder for everyone to believe in ourselves and do the things we love. thank you! MJ i am so sad to have missed the potluck (for both reasons!) and especially seeing you in NYC this past weekend. Personally, I think you’re a beautiful person, inside and out, and you bring so much and give so much to others. I think that next time when you look at yourself, make a small list of things you are proud of. We’re all in short supply of self praise and sometimes it’s very important to be your own biggest champion. I think you’re a very good writer. I feel almost banal saying that a book, if you have a story in you, will shape itself in time. You can’t rush the fruit ripening on a tree – let the idea ripen. And to echo Molly’s suggestion – in the meantime, write, write, write. Beautfiul post from someone who sounds so lovely! 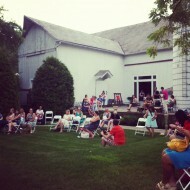 You captured the weekend of Big Summer Potluck so well with your honesty, candor and true voice. I wished there had been time to get to know you better. Thanks for sharing this post! And yes, you have a bestseller in you, don’t ever doubt that! Cheers! Beautiful words, you’ve captured the essence of the weekend in the most poetic way. What a lovely re-cap! It was really nice to meet you at Sunday’s breakfast. I wish we’d had a chance to talk some more during the weekend! Looking forward to seeing you next year (if not sooner). If anyone has a book in them, its you. Your words are so beautiful, vulnerable, and true. What a gorgeous POV on this weekend. Thank you for your gorgeous words and beautiful honesty. Spending time with you this weekend was a highlight. 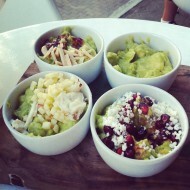 More, please! I’m so happy to have met and spent some time with you last weekend. One of the highlights, hands down. Isn’t Molly transformative? Can’t wait to see that book come out of you – this writing is only a small example of the amazing talent you have. Thank you. Lovely, truly lovely words. I was so happy to spend time with you this weekend. Something I’m going to remember for a long, long time. Looks like a lot of fun. I wish I were there! I’m so thankful that we got to meet and for the time that we spent chatting. This post eloquently sums up so many of the things I felt last weekend. I really hope I get to see you again next year! So well said! You capture so many of the important moments of the weekend, and the thoughts and feelings behind those moments. Since getting back I’ve felt such an intense clarity, and a similar willingness to look at the things that are right in front of me. Mostly I just feel like, let’s do this! I can’t wait to read your book, whenever it materializes. And, it was so wonderful to finally meet in person, and I’m hoping our paths will cross again soon! I always love your takes from events like this, always written in just your way…you always find the right words to describe in such a way that I feel like I was there MJ. Your photos, especially the one of the porch & bench, are stunning! The next time you look in a mirror, please give her a big smile. I am finally getting around to reading all of the BSP recaps, and I started with yours. What a lovely post, beautifully capturing everything we all felt. I am glad to have met you, and look foward to getting to know you even better through your blog and hopefully in person. Oh girl – I love love love reading posts like this and seeing how powerful of a transformation one can have just by being surrounded by the right people. This made me happy. Thanks for sharing so much of yourself with us. Sounds like an amazing adventure was had! Merry, this is quite possibly the most beautiful post I’ve read about BSP… I’m kind of glad I waited until after I’d posted my own recap to read it, if only because I’d never have had the nerve to write anything of my own after reading your eloquent and heartfelt words. It was wonderful to meet you, though I’m sorry we didn’t have more time to chat. Next year, hopefully? PS: I can’t wait to read your book. I hope it finds its way out soon.